As I have a significant thesis milestone coming up at the end of the month, I won’t be able to get out as much as I’d like. 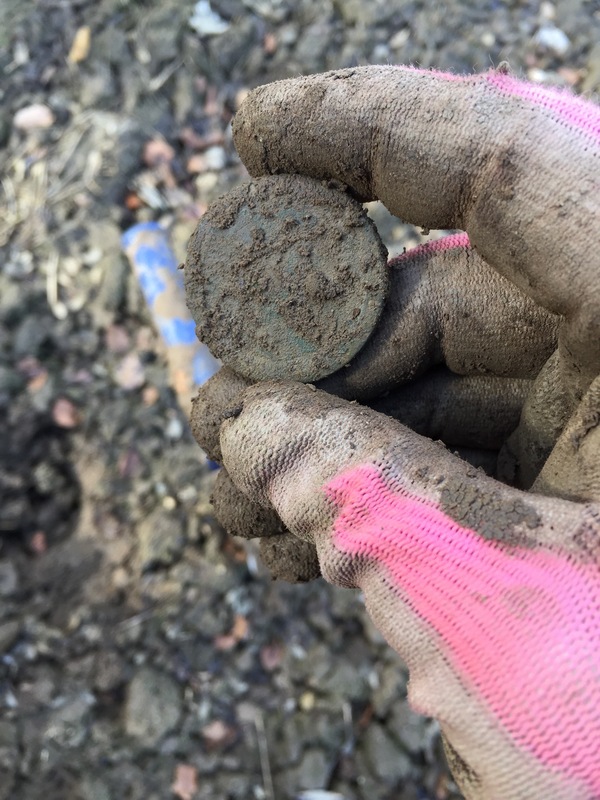 Therefore I wanted yesterday’s hunt to be special: I wanted to spend a lot of time in the field and find at least one object of historical significance. 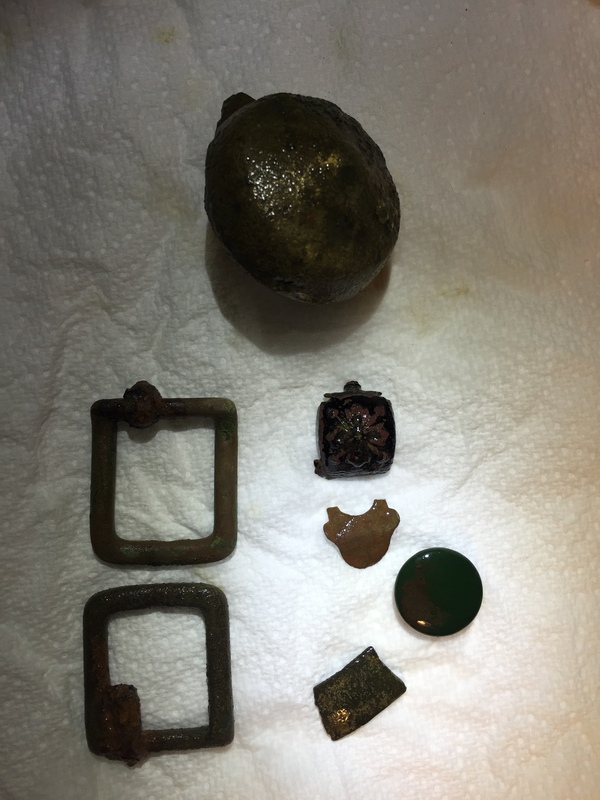 I moved onto Sir Thomas, a field that was to play the central role in the success of the day’s hunt, but all I found after twenty minutes of swinging was a lead bag seal, pressed with an ‘E’ on one side and ‘BOWLEYS’ on the other. 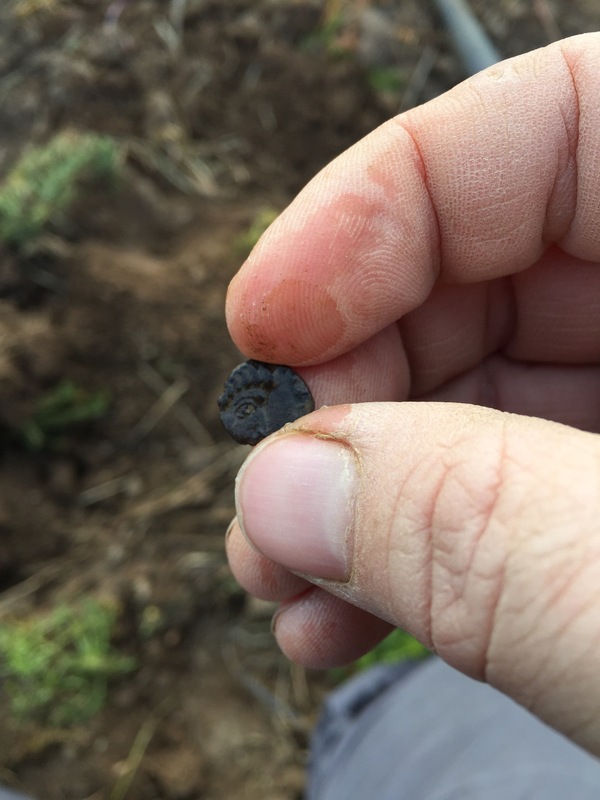 Hankering to try something new, I walked across a newly planted field and made my way to some pasture near the farmhouse. There under a lone, winter-barren tree, I ate my lunch in the sunshine. as well as a ten ‘New’ pence piece (1979), one of the post-decimal but thicker ones. It was now edging towards two o’clock, and as I had been detecting, digging, and walking since eight, my spirits were beginning to flag. 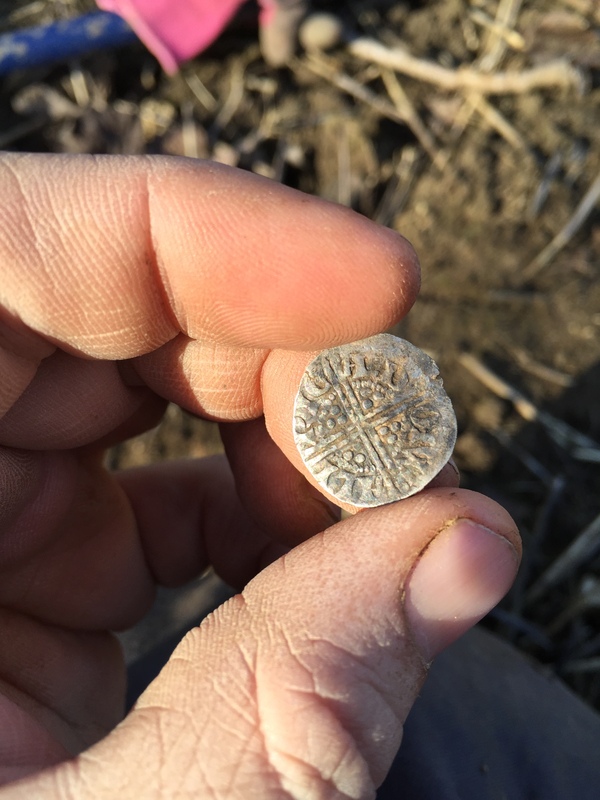 Still, I decided to press on; your detecting luck can change in an instant, and one great find changes the whole feel of a day (also, as my friend Gerry says, even when detecting is muddy, cold, and fruitless, it’s still ‘good, clean fun’). 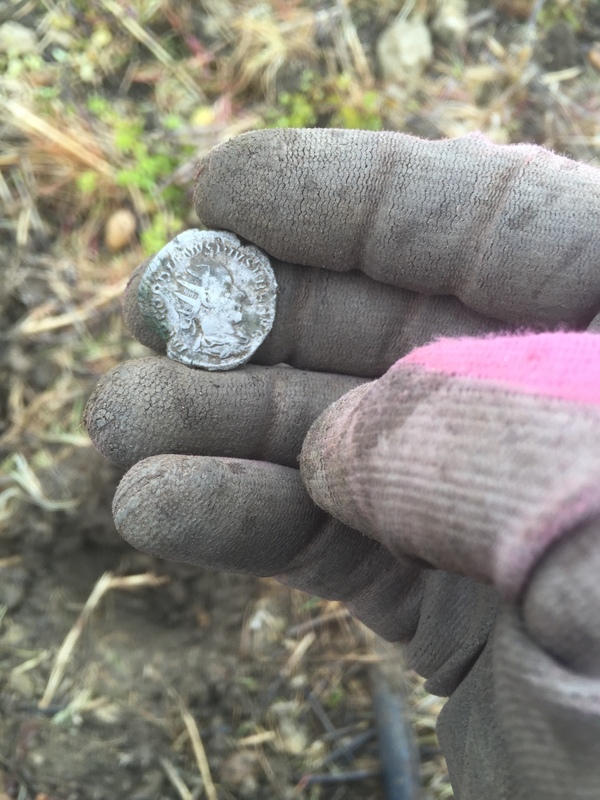 I turned back to Sir Thomas, knowing that I’d found that spectacular silver antonianus there just two days before. 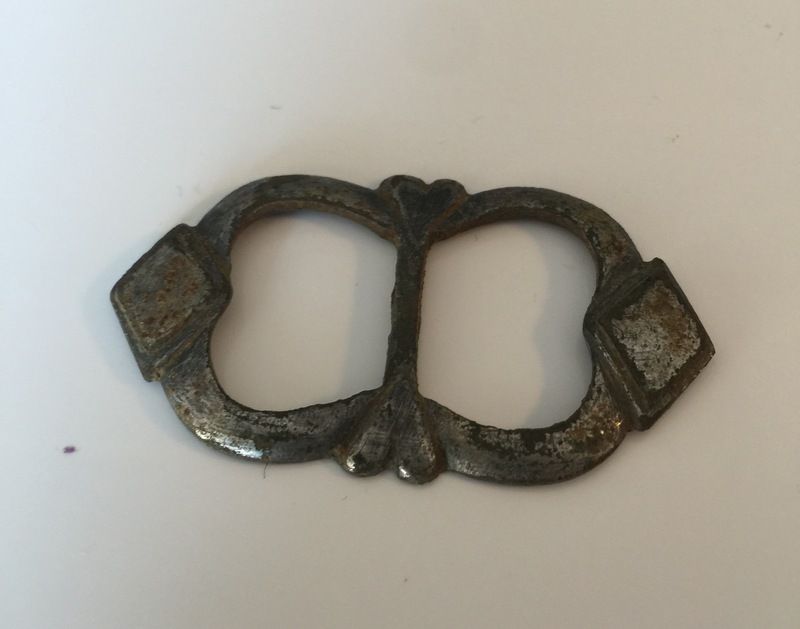 In a bid at self-psychologising, I tried to tell myself that this, at least, was a fascinating find — that this is what I’d spent six and half hours searching for. But the attempt didn’t take. 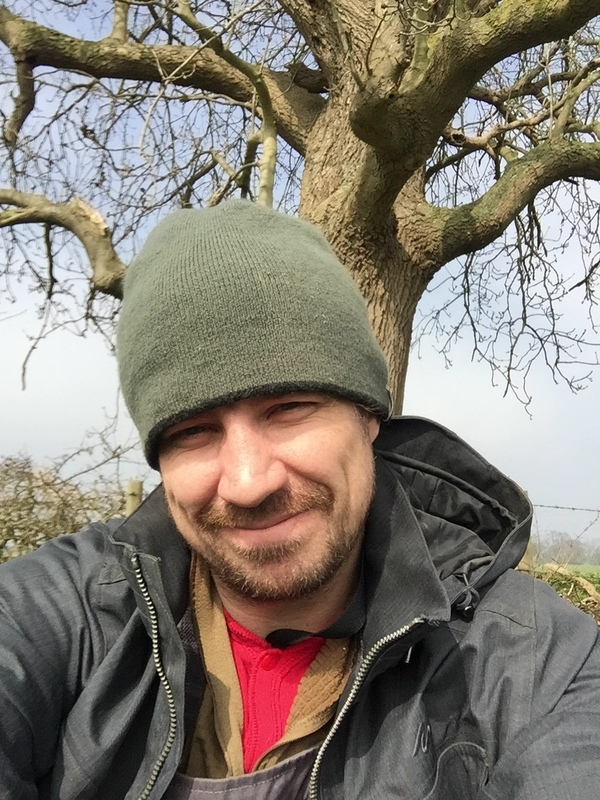 I moved out across the field again, willing a spring into my legs despite my badly pulled groin (I think from crossing a fence days earlier). 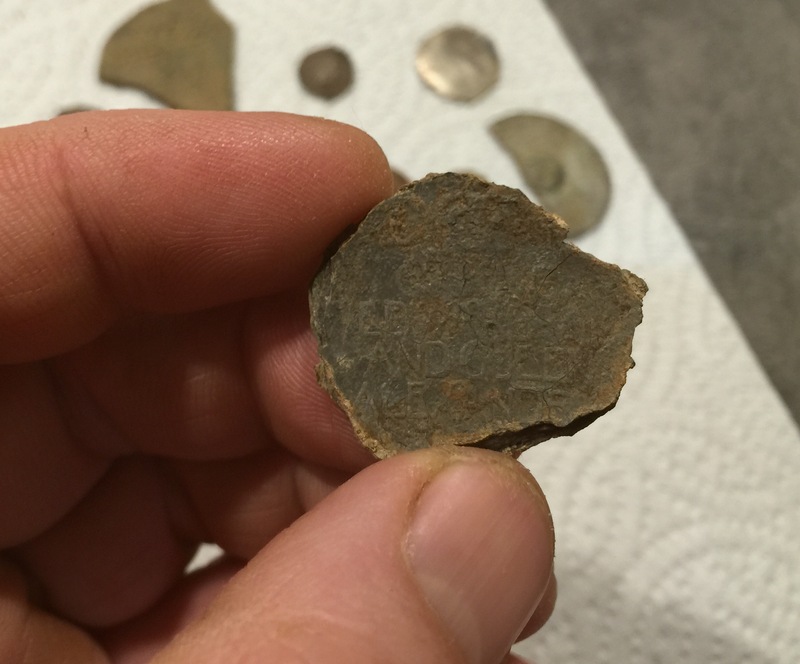 Not long later I found a cut or broken piece of coin, maybe with some silver content, too damaged to see anything on it. Again I told myself that this was more like it. Except it wasn’t. I thought about returning to the car and trying to get home before close-of-business traffic. 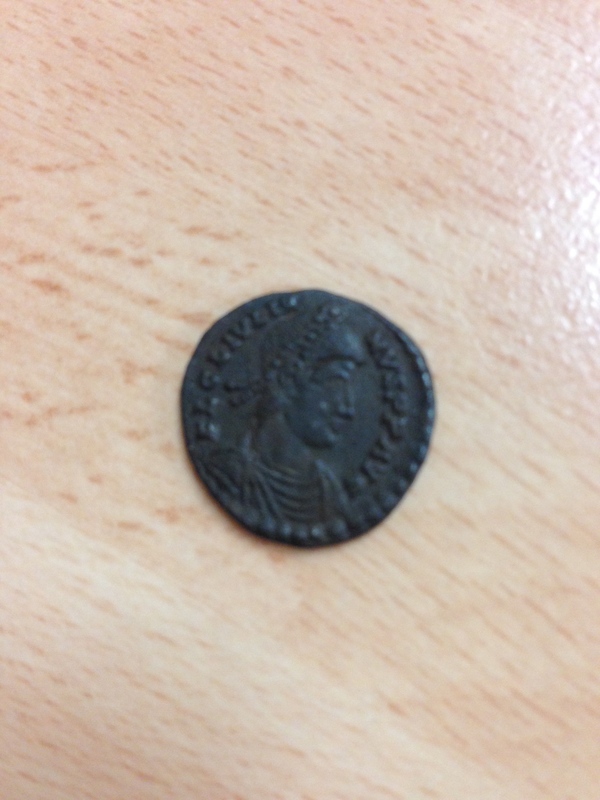 But then I found a Roman coin! 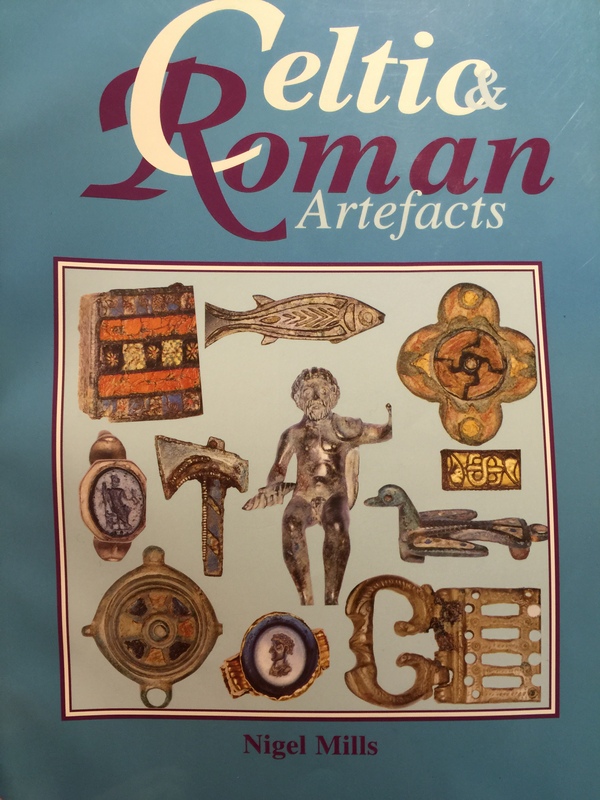 Sure, it was a small and illegible nummus, but it was definitely Roman, something for the eventual collection I hope to turn over to a local museum. Five minutes later and just ten meters away, I got a cracking signal reading 81 on my AT Pro’s VDI. 81 almost always means aluminum can — I mean, it has ALWAYS meant that for me. 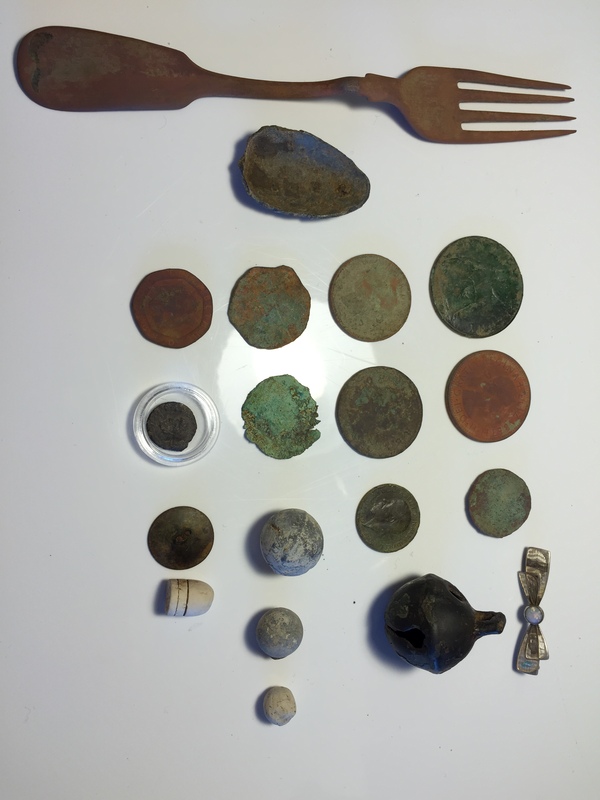 But for some reason, probably the new-found buoyancy at digging the antonianus — I decided to take a shot. 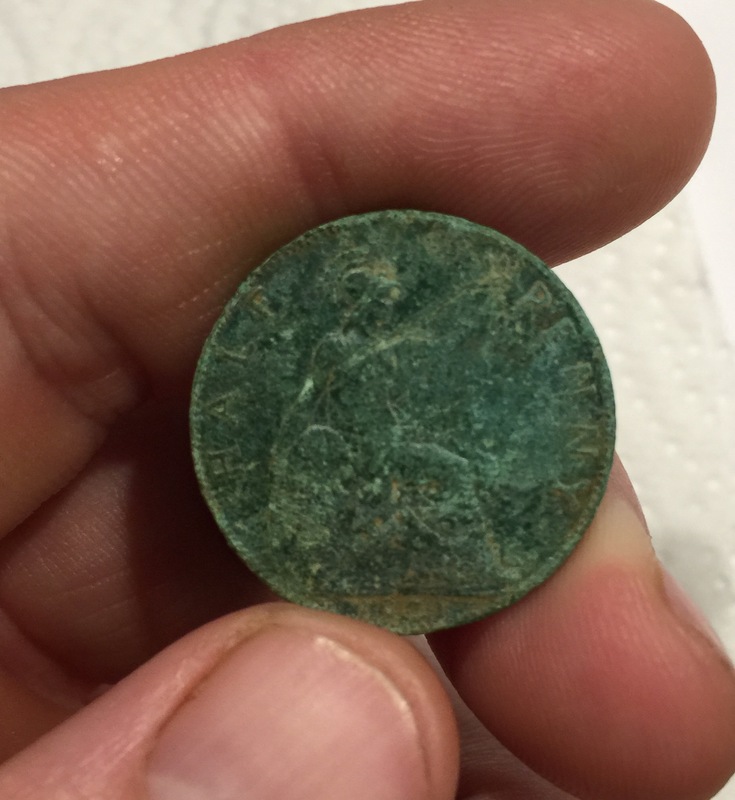 And out popped a coin with a beautiful glowing-green patina that felt as heavy and thick as a skipping stone in my hand. 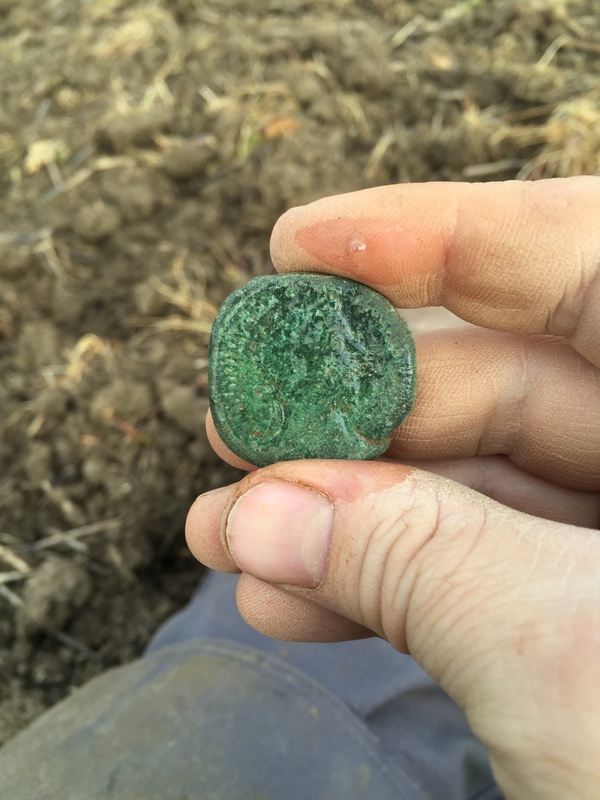 Another Roman, and so huge! 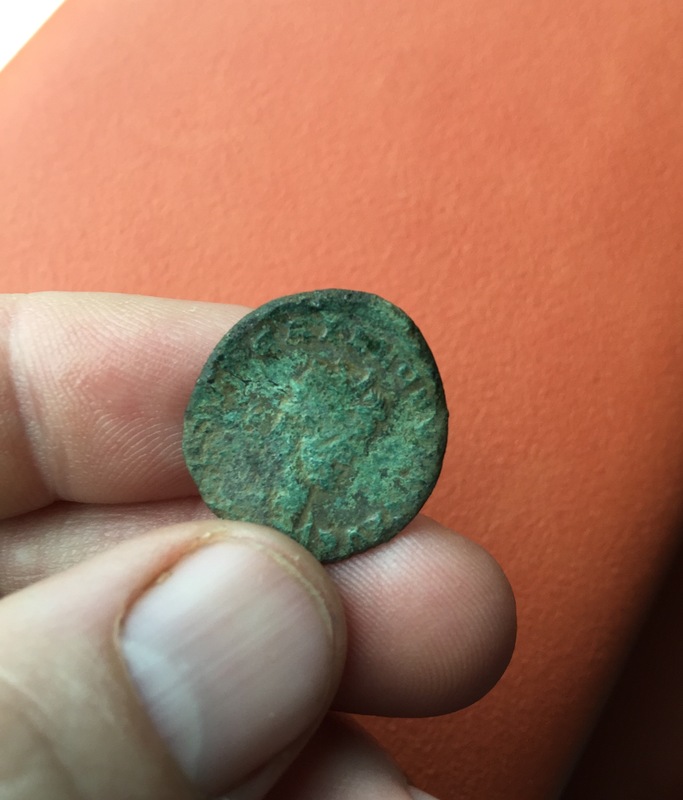 I didn’t know what it was, but I suspected a follis or sestertius (it turns out it was a sestertius, probably of either Marcus Aurelius or Trajan). 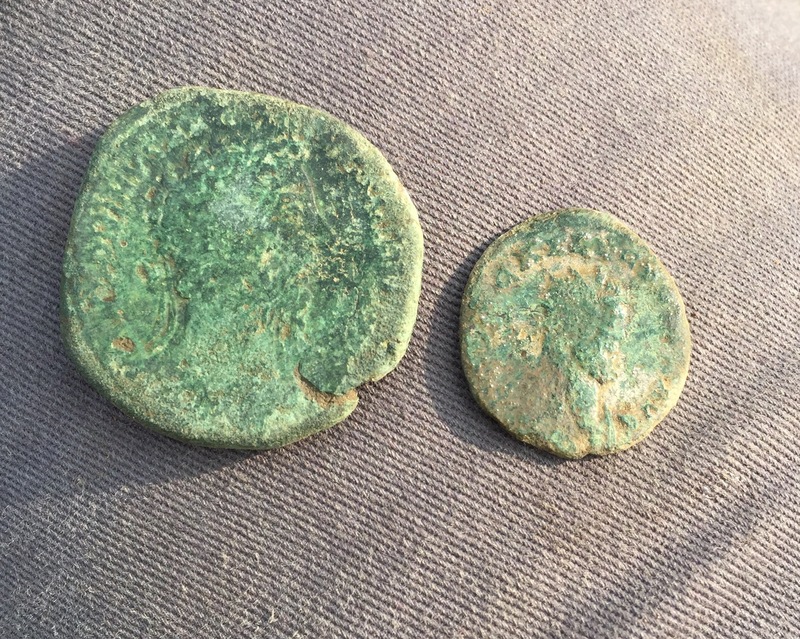 I didn’t get onto the Romans until after 3:30 pm, at which point I’d been detecting for seven and a half hours! 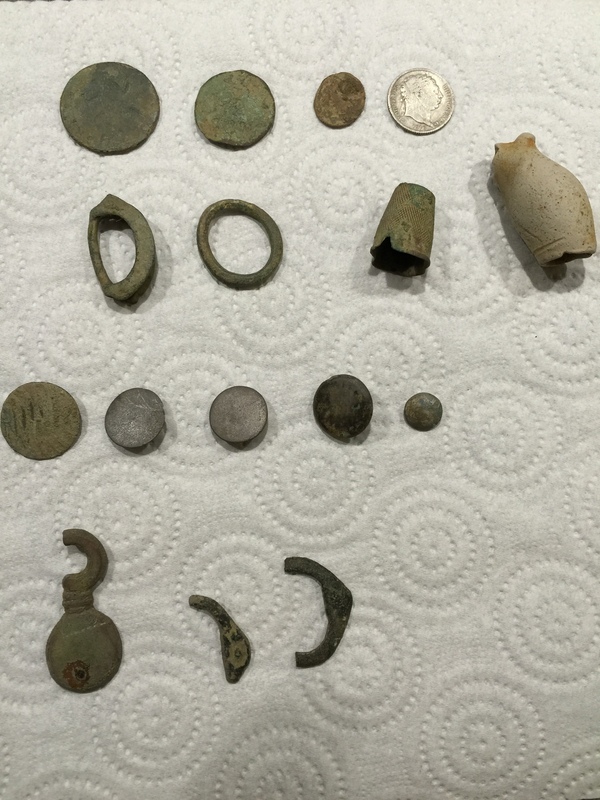 Persistence definitely paid off, and it was a worthy hunt to lead into the (reluctant) time off from the hobby. 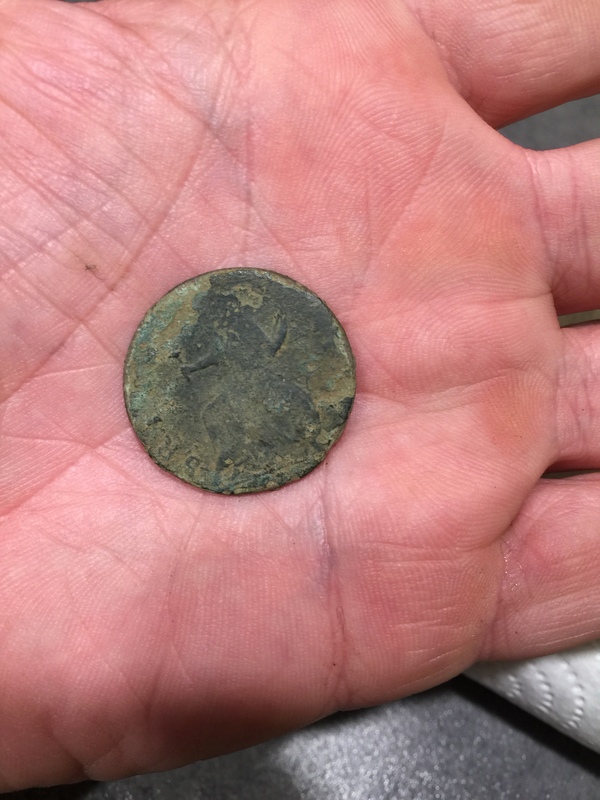 I’ve been noticing lately that I average about a coin an hour. 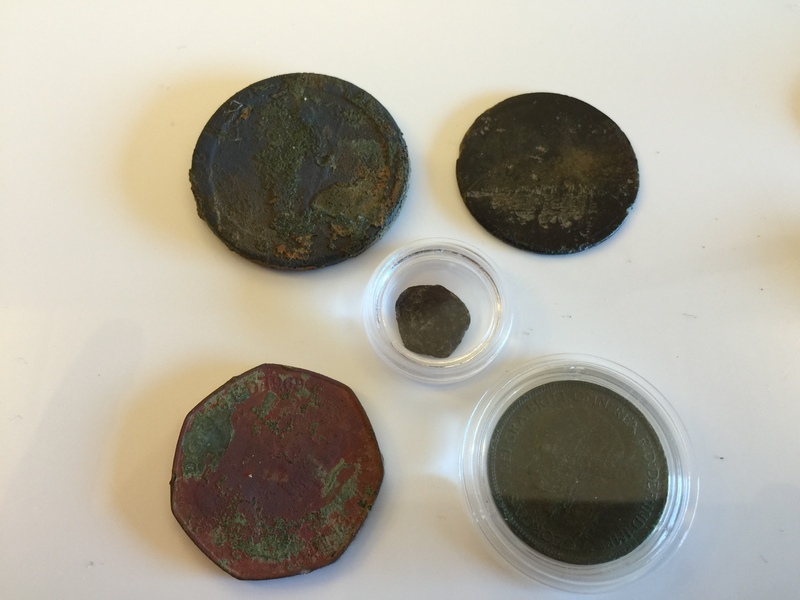 Strangely, this ratio seems to hold regardless of the type of coin or the terrain. 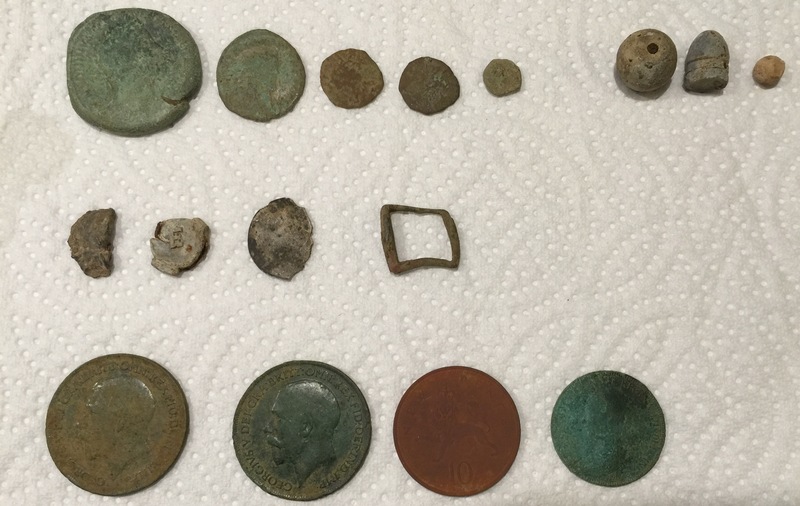 And it was true of yesterday as well: I hunted almost exactly ten hours, and I finished the day with a sestertius, an antonianus, two nummi, a minim (five Romans altogether); two George V pennies; a modern 10p; a cut, unidentifiable hammered coin or jeton; and a Victorian ha’penny of 1901, the year she passed. 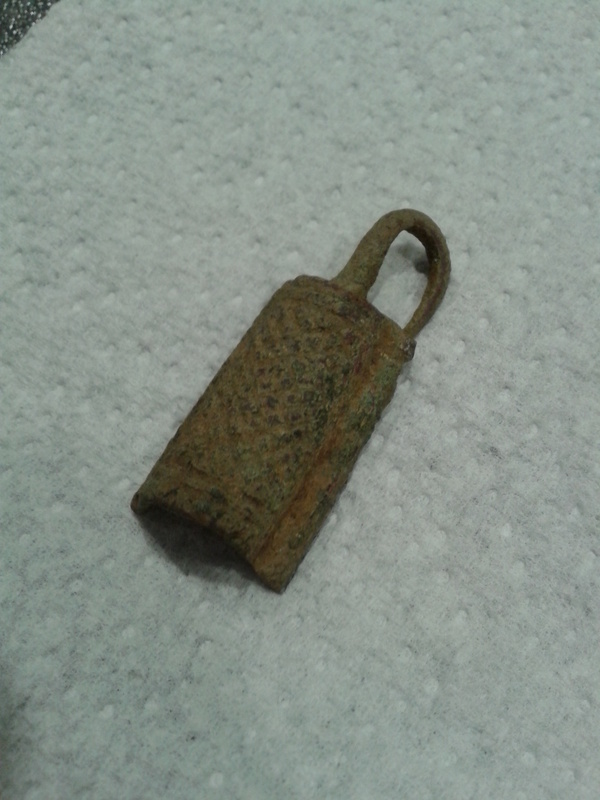 I found this near the Roman zone, just after finding the second nummus. 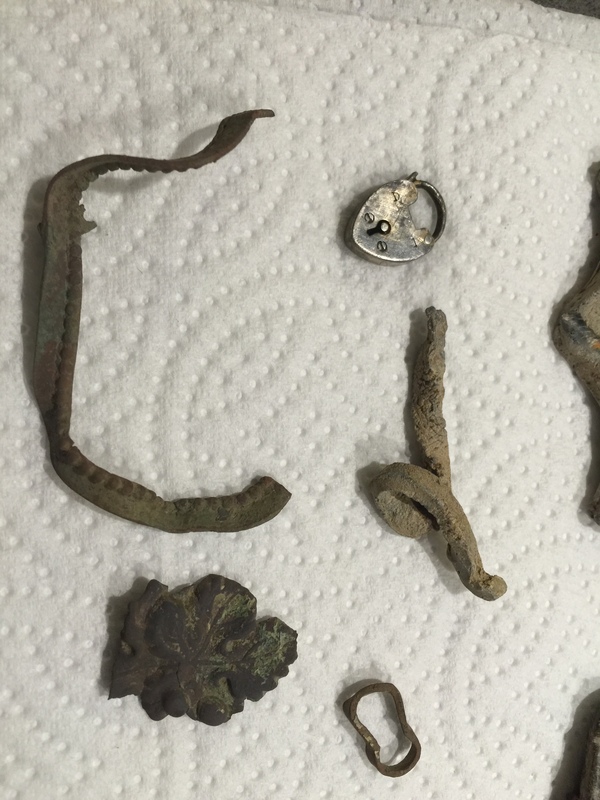 All in all a tiring — at times frustrating — but amazing day, arguably my most successful ever. 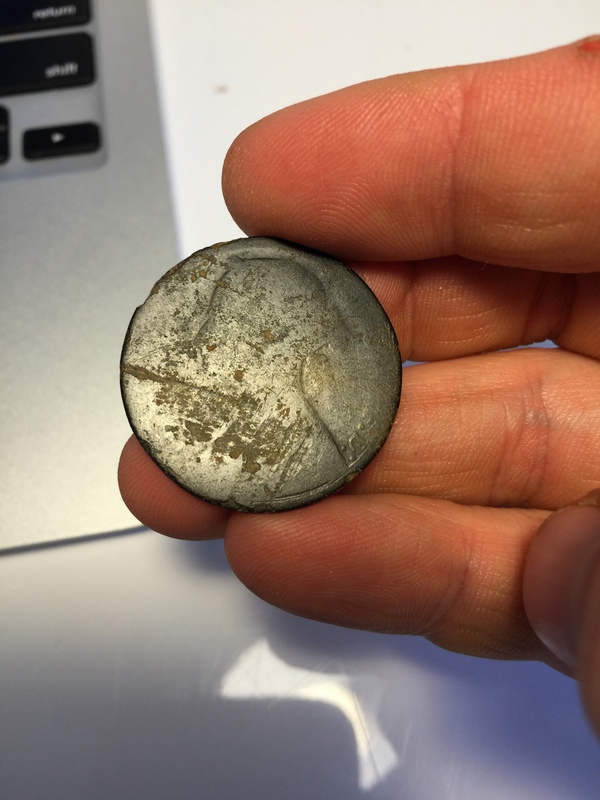 I cleaned the smooth and knackered half-coin I found yesterday and did the ad hoc silver test (spit in tinfoil which reacts to the tarnish)…turns out it is silver! 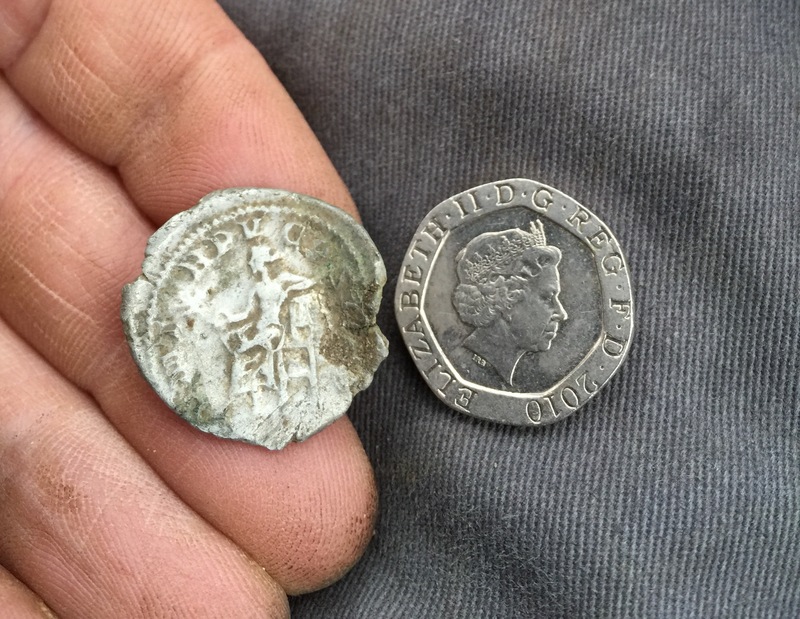 So I had a silver coin (what was left of one) yesterday as well. 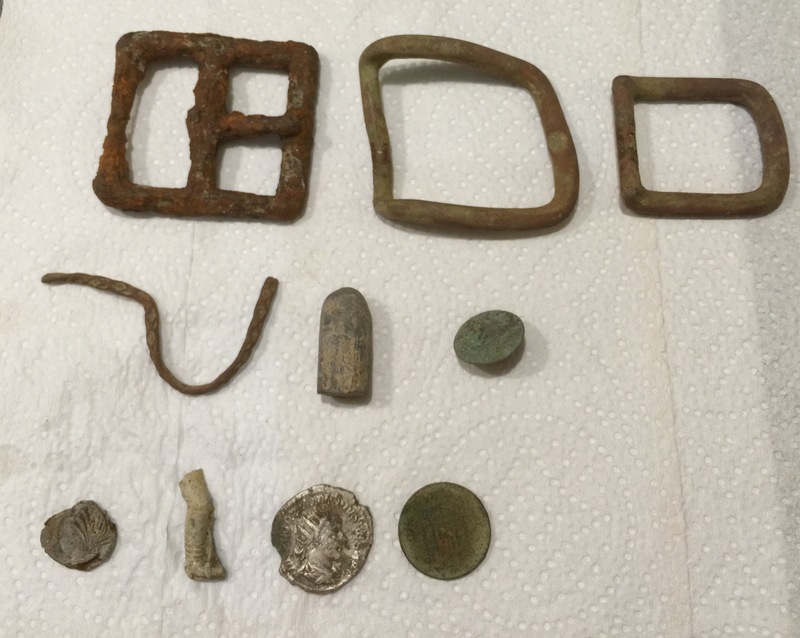 This was the day of the monthly OBMDC meeting, which happened also to be the Annual Group Meeting, and I tried to sneak in one last hunt before the evening, so that I’d have more to record. I wanted to be on pasture rather than battling mud, so I selected Oscar Wilde. 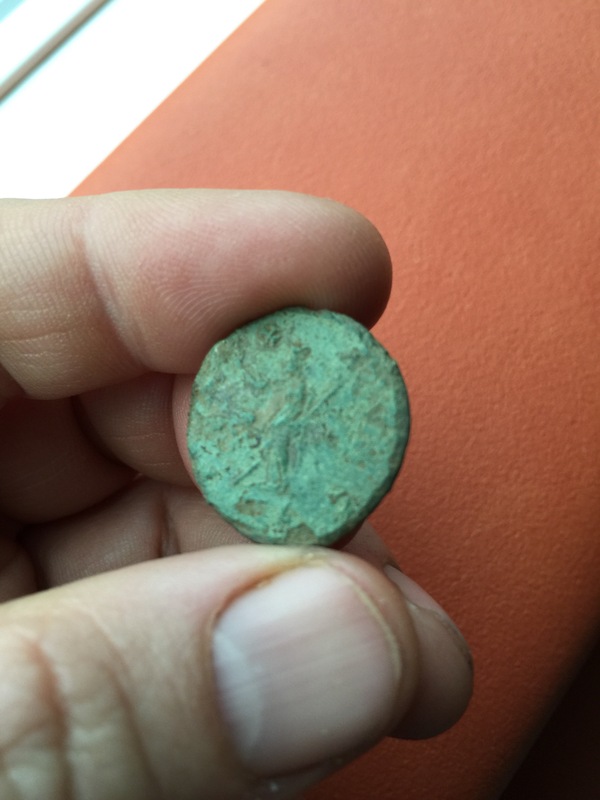 I was also keen to see if it had any Roman to offer up, given its proximity to Ulmo where I’d had Roman luck. Did it ever! 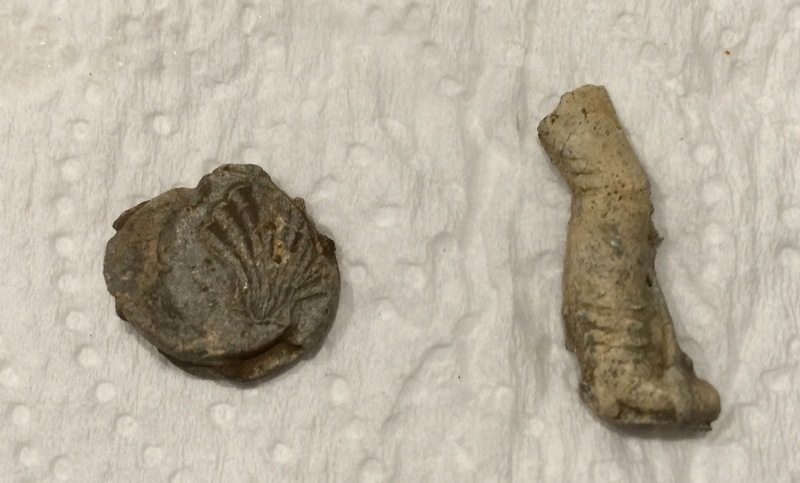 By the time my short hunt was finished, I’d found five Romans: two have some sort of visible image on them, a bust and what looks like a dolphin, respectively; I’ve prepped them for PAS recording in hopes of ID’s. 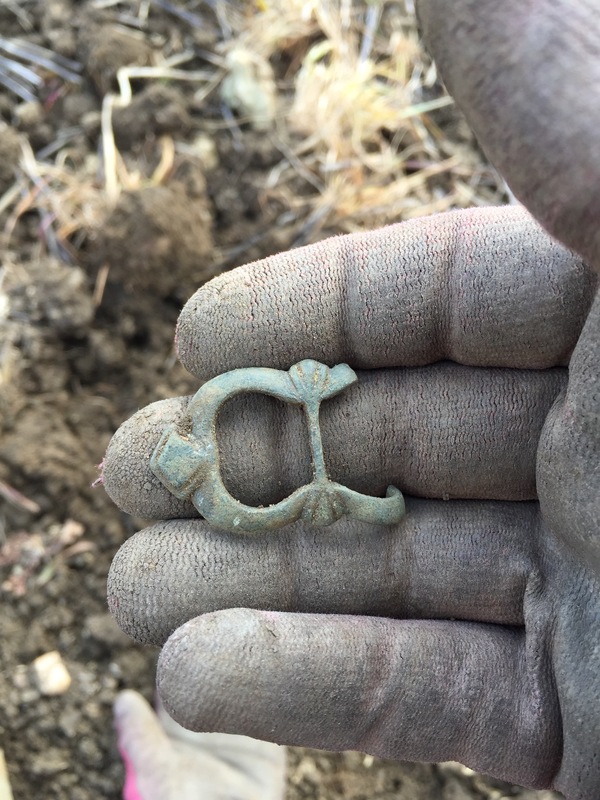 Two more are grots, and the last is only potentially a grot — it could also just be a grot-shaped bit of nonferrous metal. 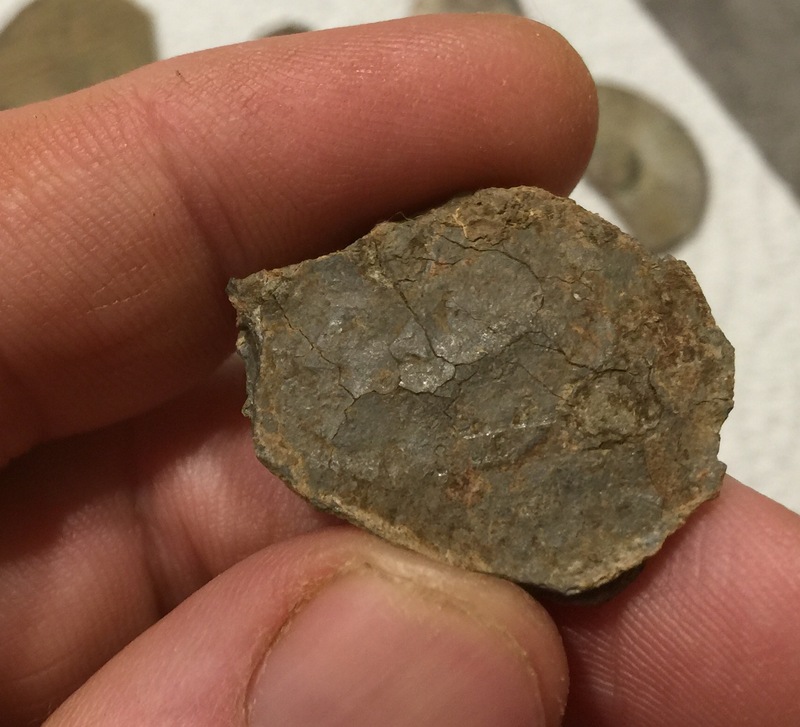 While digging what turned out to be a chunk of lead, I also found, eyes-only, a bit of garnet that looks like it might be a Celtic intaglio, or engraved material. 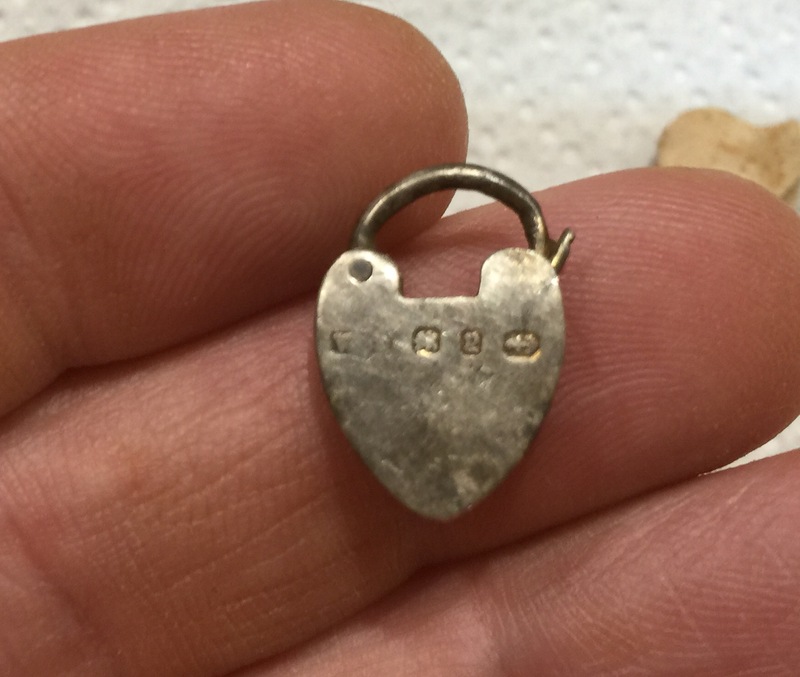 Besides the Romans, my favourite find was a little heart-shaped padlock in sterling silver, complete with a silver lion hallmark on the back. 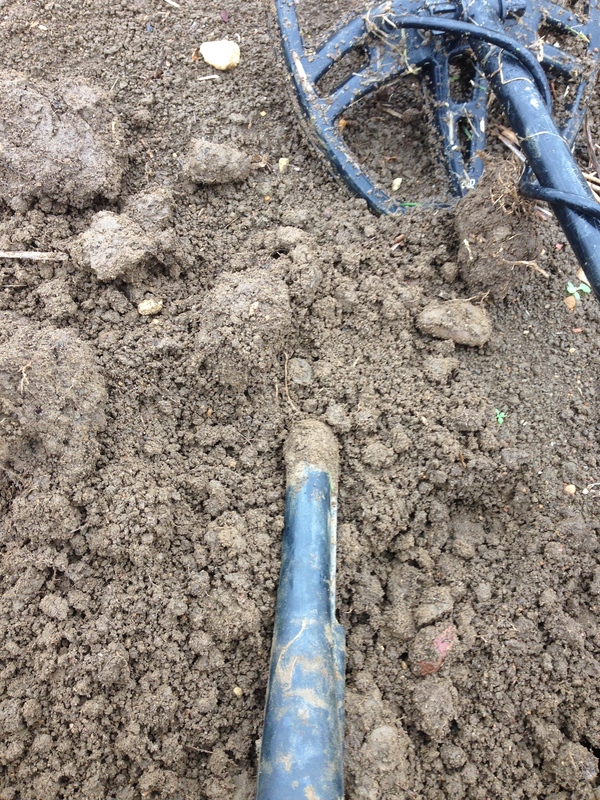 The other day I’d seen that a field I call Peter Quince was being ploughed, and I thought I’d try my luck. 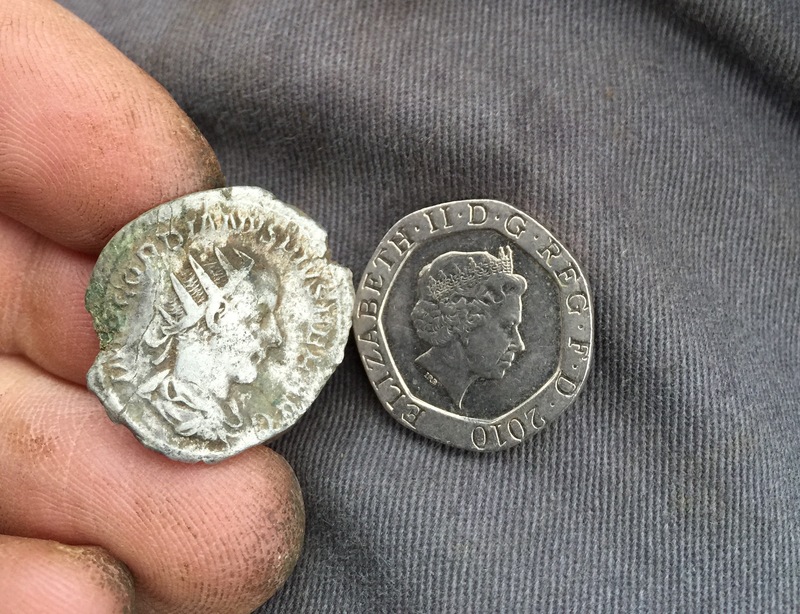 Clearly Caesar’s oracle didn’t apply to me, as about midway through the field I found my second-ever silver hammered! 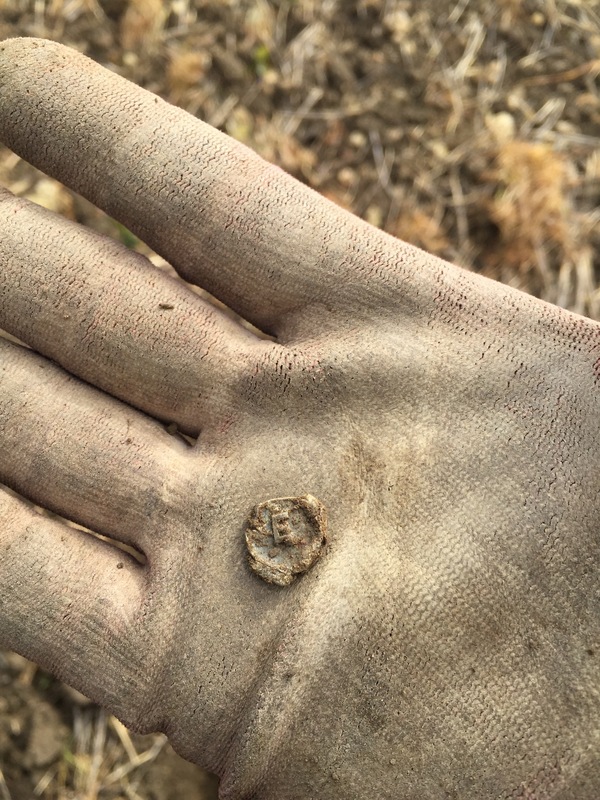 This was a tiny coin, lying on the surface. 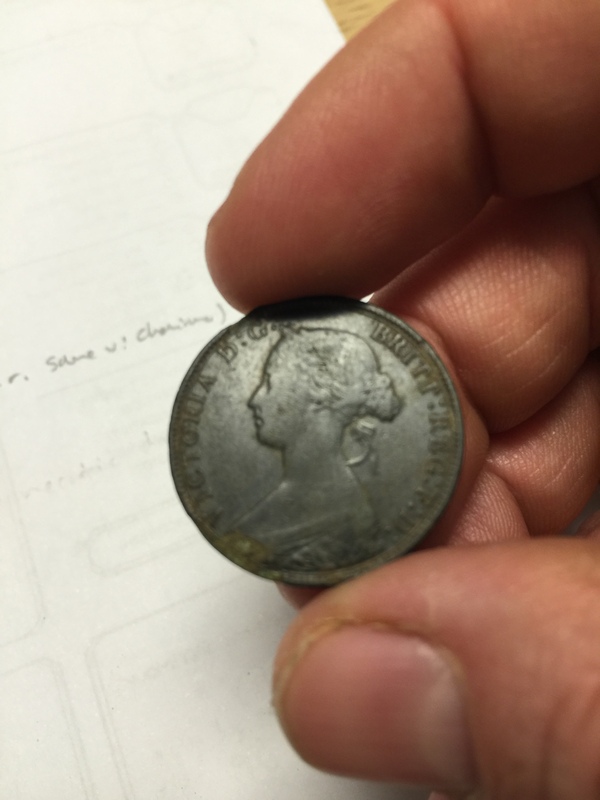 The obverse looked blank, but later when I viewed it through a jeweller’s loupe, I could plainly see Queen Lizzie and a rose. 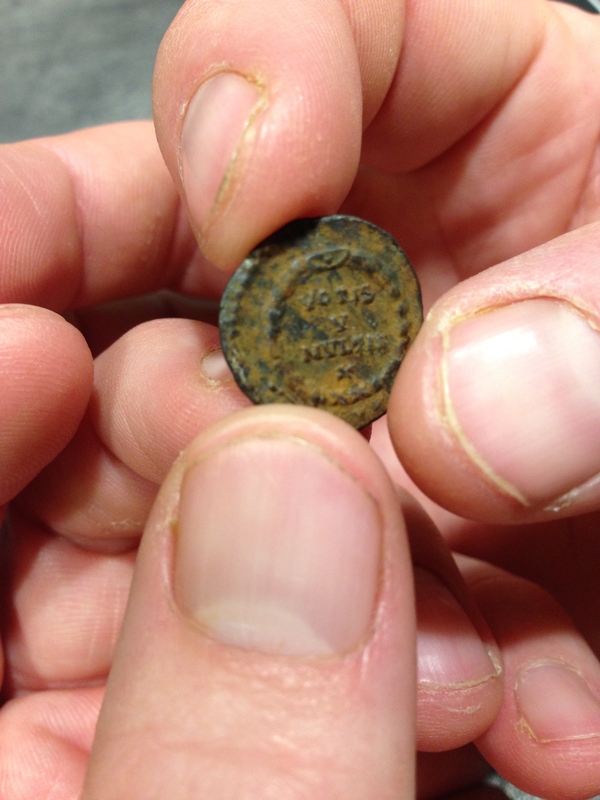 The reverse is quite clear, featuring a shield and the date, 1575. 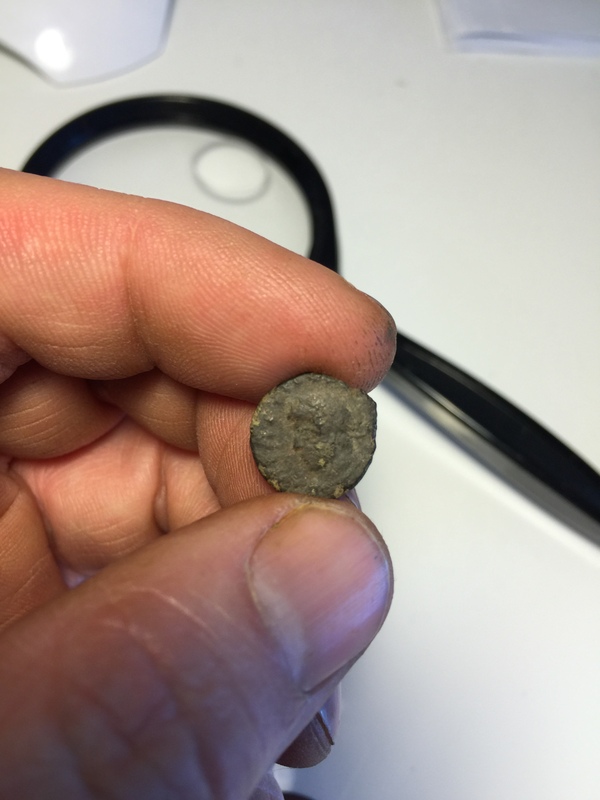 Probably a three farthings or a farthing, considering the minuscule size. 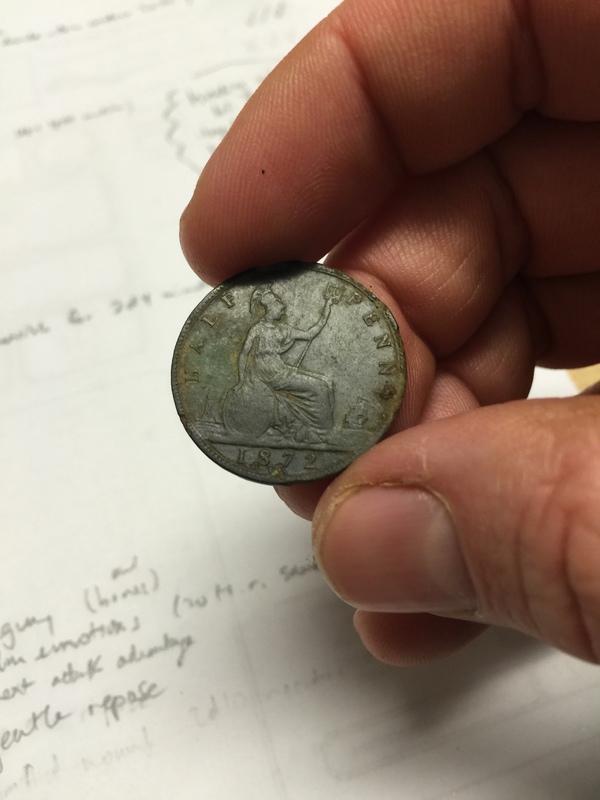 I was thrilled finally to have a coin from my research period. 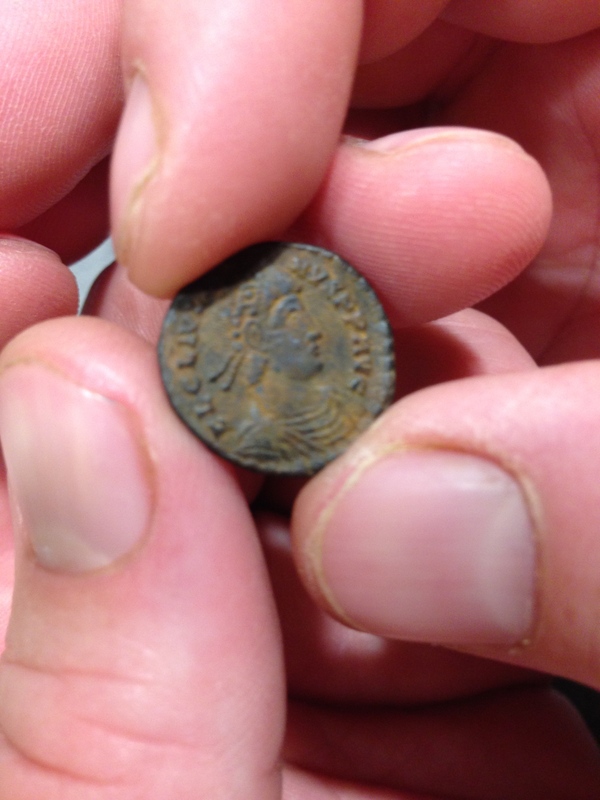 Not long afterward I found a lovely fragment of Roman coin, with a nose and eye in profile plainly visible. 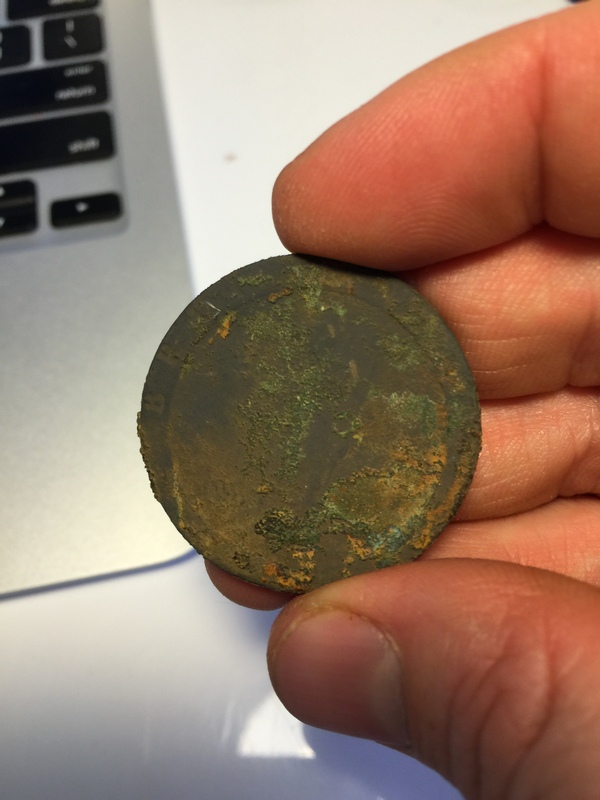 If only the coin had survived entire, it would be a thing of beauty. 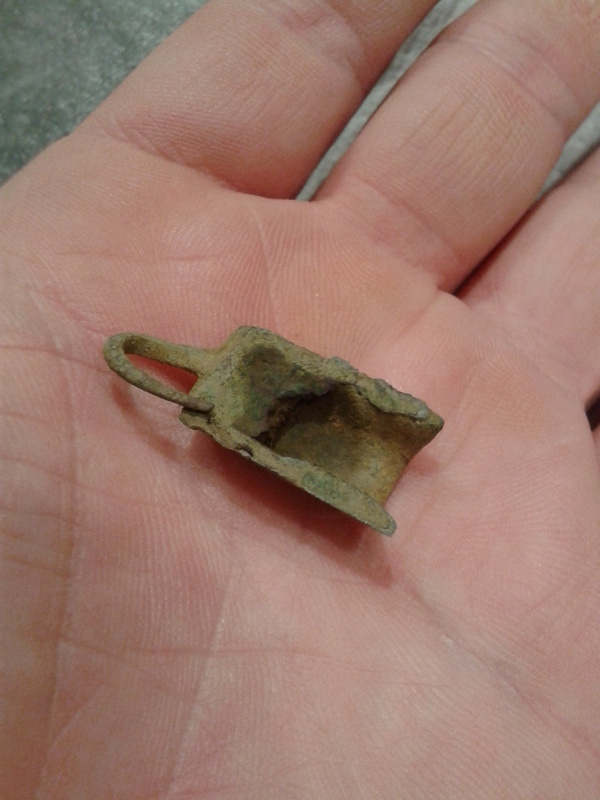 The fragment was hard to isolate from the mud and gave a very iffy signal; I’m glad I stuck with it. 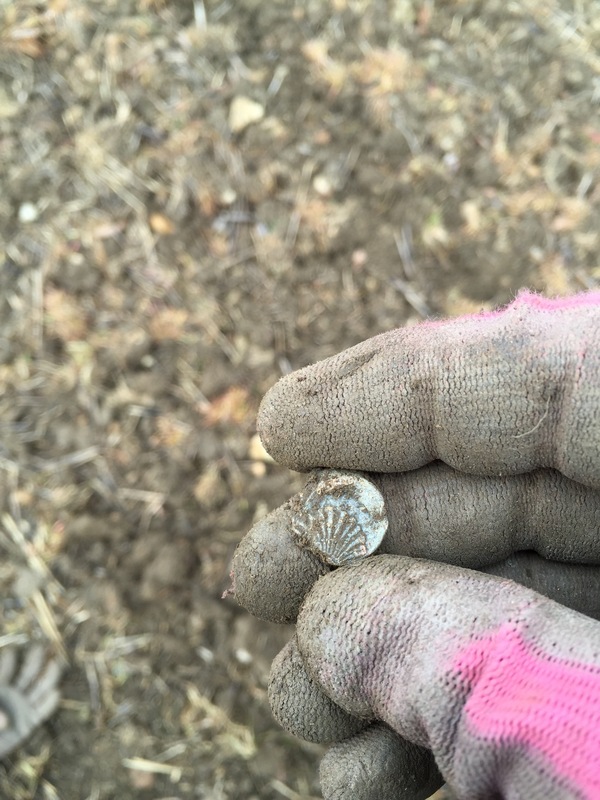 After finding a few other bits and bobs, I crossed into Falstaff, which had also been ploughed. 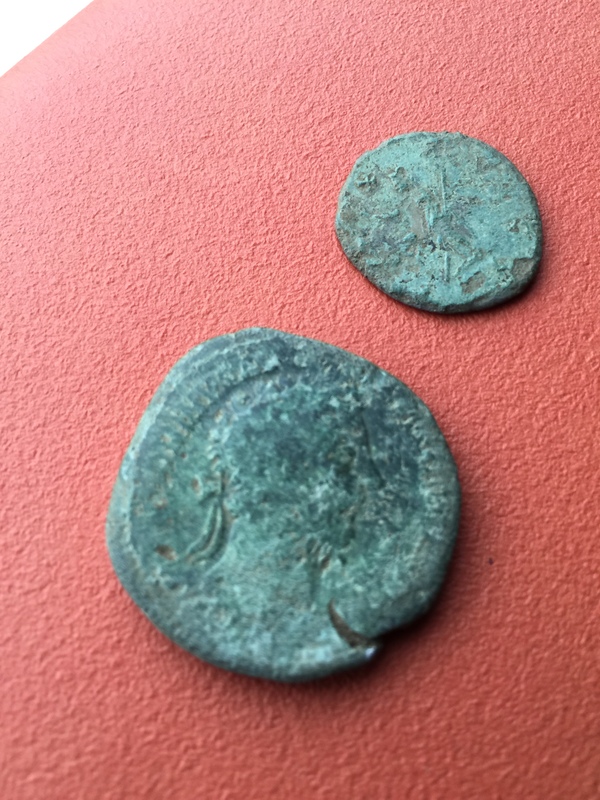 My hunch paid off, as no sooner had I started detecting in the corner of the new field than I found my finest Roman to date, a Claudius II Antonianus. 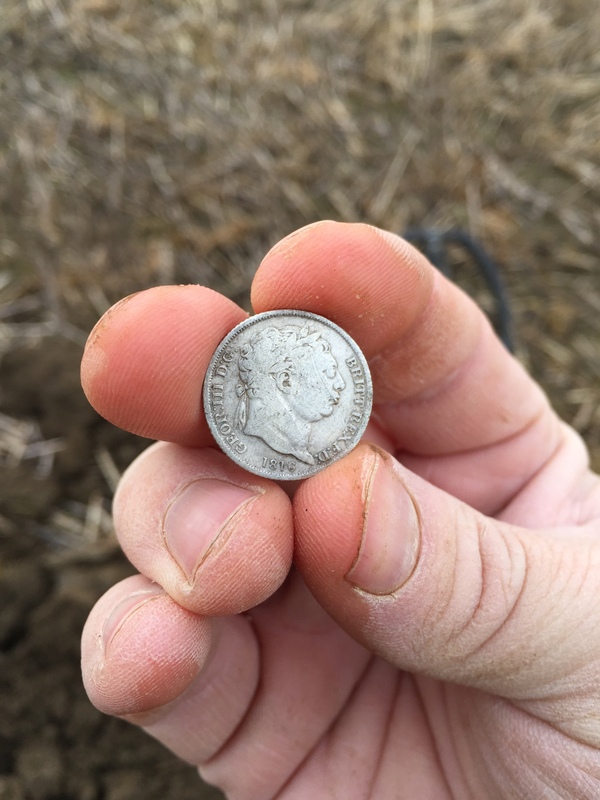 Also in this field I found another spindle whorl, a couple of pennies, Edward VII (1907) and George V (1920), and a George V ha’penny. Can you make out the faint profiles? 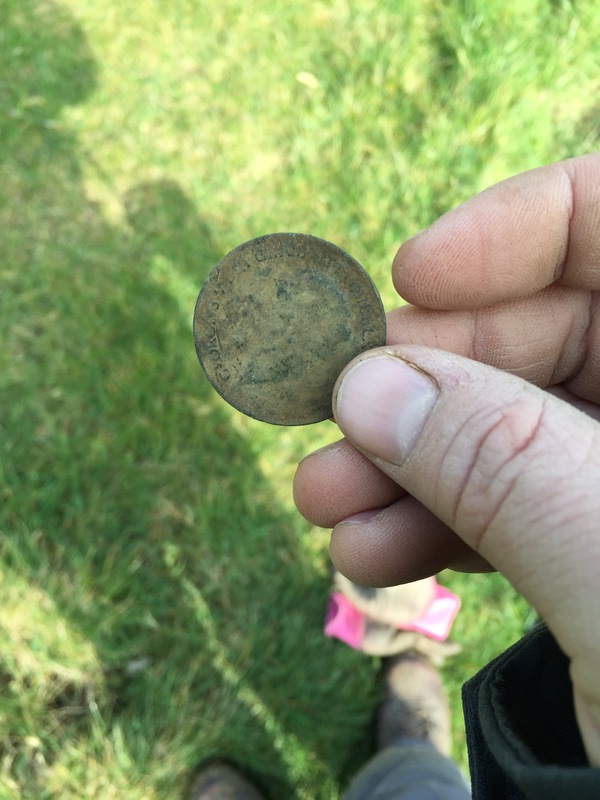 Returning to Peter Quince I got a strong signal for a Victorian ha’penny in very nice nick (1872). 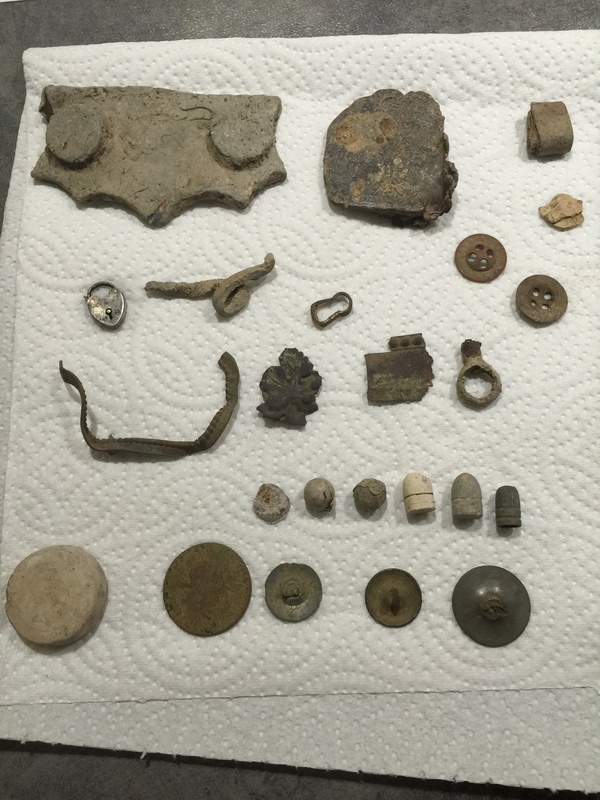 Overall, my best hunt so far, I believe. 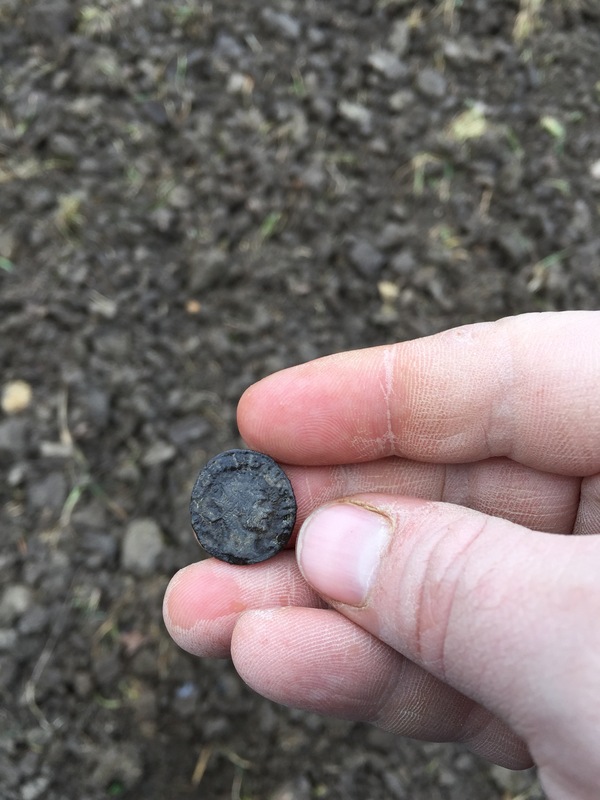 It was raining this morning, so although I was keen to follow up yesterday’s fascinating finds, I was reluctant to face the newly turned earth of Peter Quince. 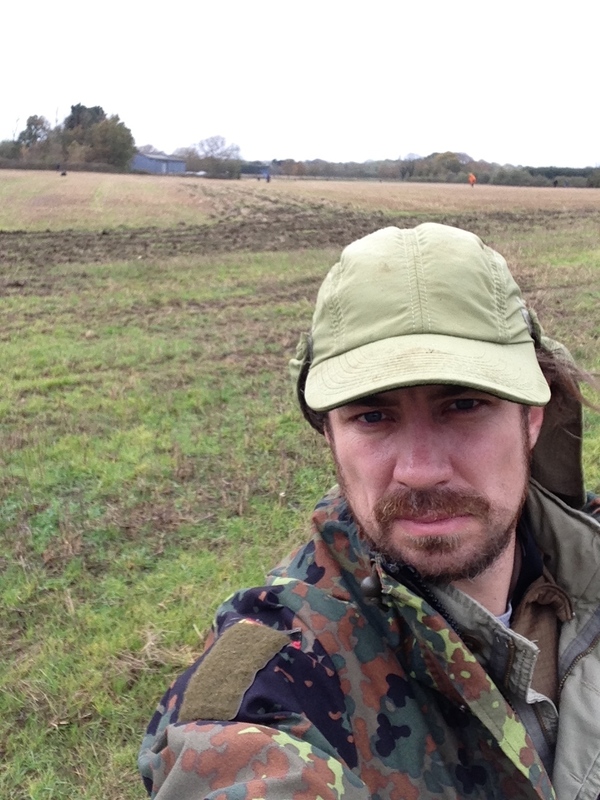 Instead I started out in pasture on a little field in near the farm buildings that I call Charlotte Shed. 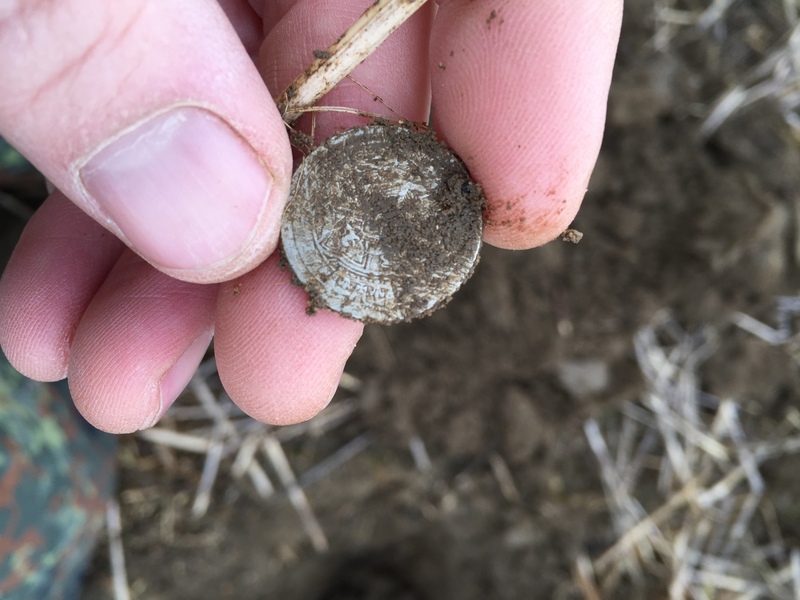 I found a nice button with the legend ‘Water WLB Lane’ (apparently once a brand of workman’s trousers), an old, possibly Victorian coin, much abraded, a modern 10p, and a pre-decimal three pence. 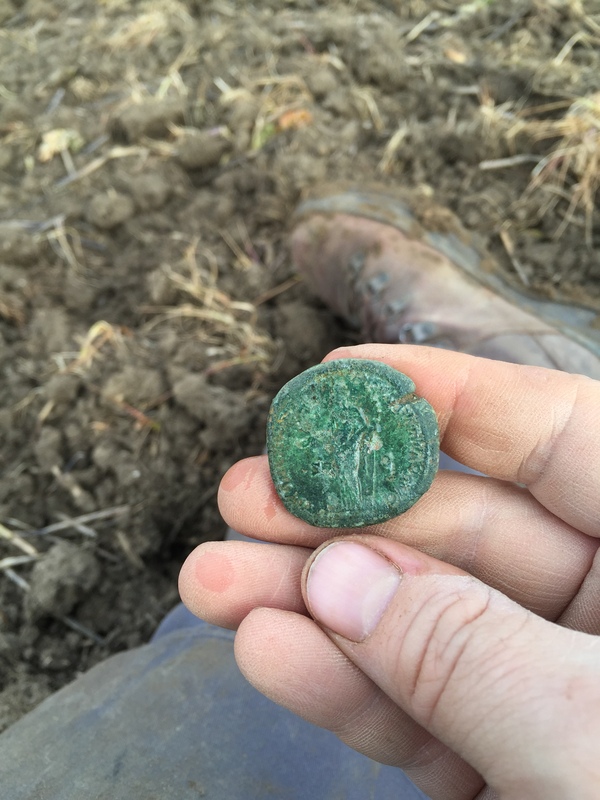 In the end I thought it would be better to be muddy and in the finds, then clean and targetless, so I made my way over to Sir Thomas, another field that had recently felt the plough. 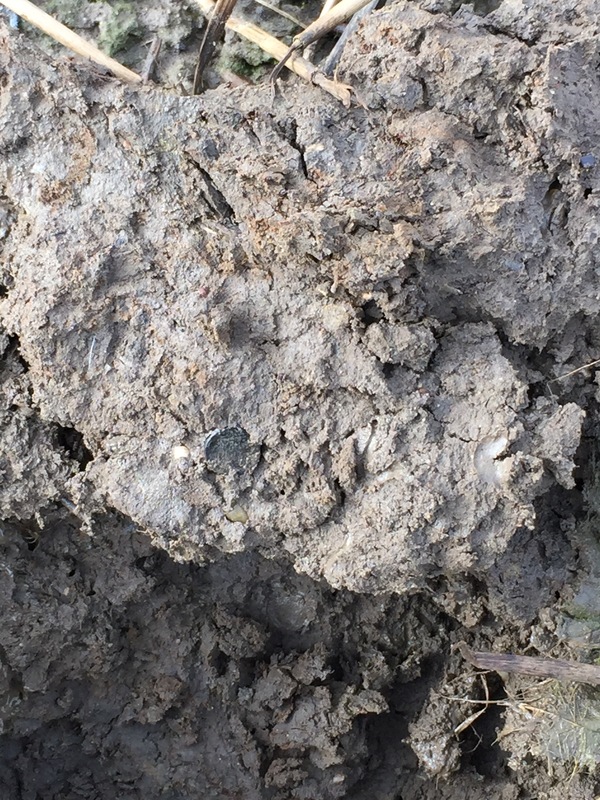 I hadn’t been detecting long, maybe an hour all in, when I saw silver winking at me from the rocky hole I’d just dug. 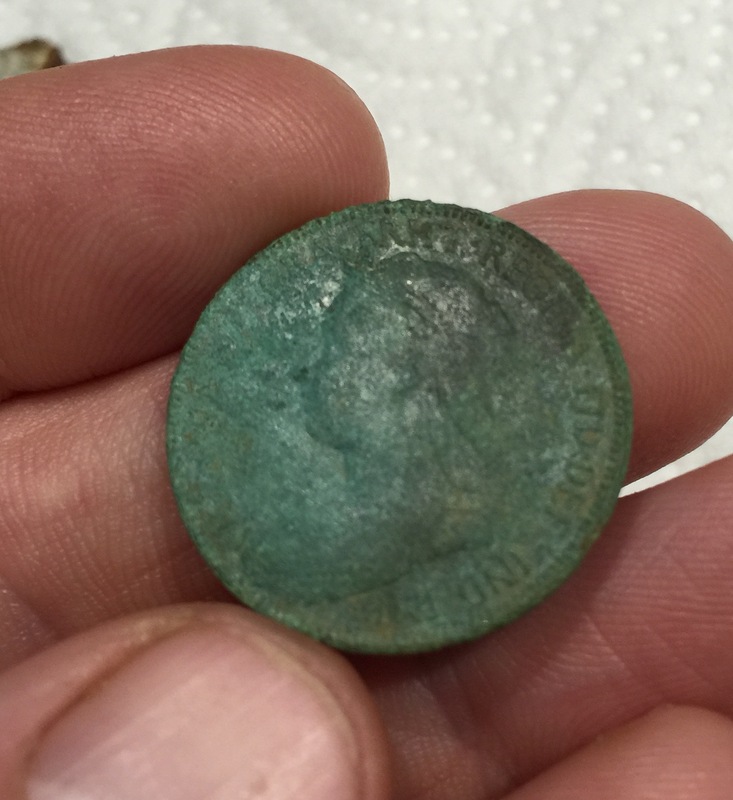 It proved to be my most exciting find to date, an antonianus of Gordius III (c. 242-244). 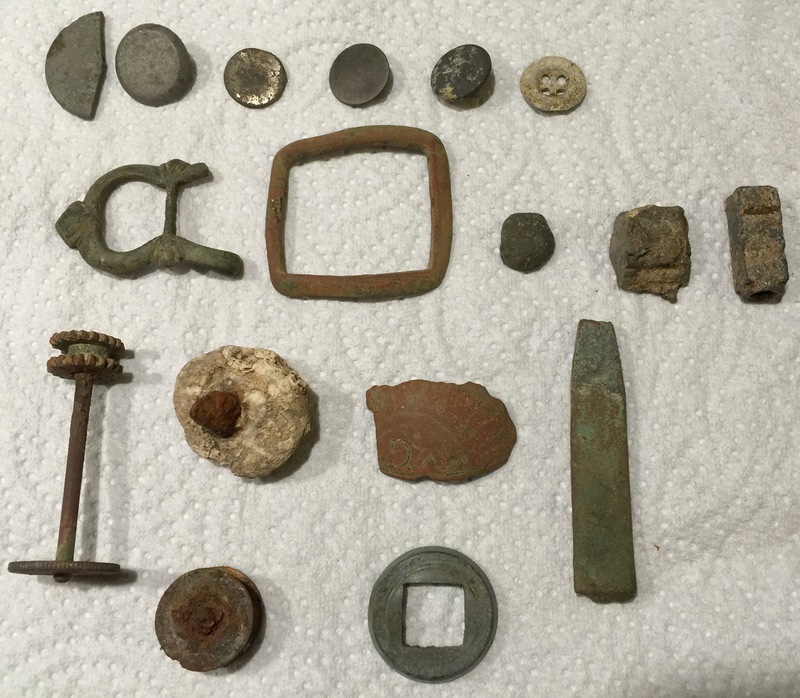 I was so excited when I turned this up that I spent a half hour or so on the spot, digging down to see if this was some outlier from a deeper hoard. 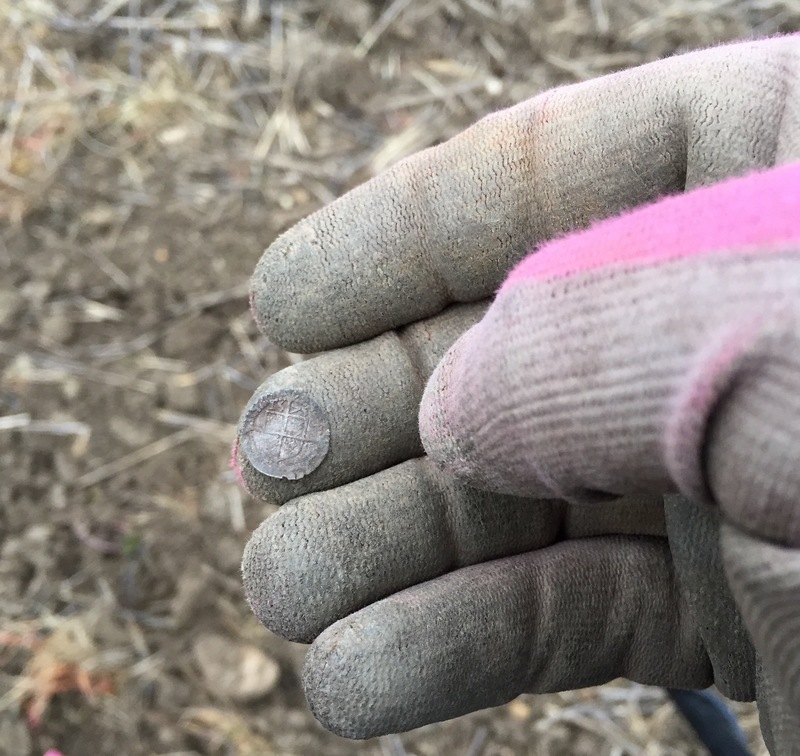 Alas, it appears the coin was a singular pocket drop; in any case I didn’t find any other signals in the area. 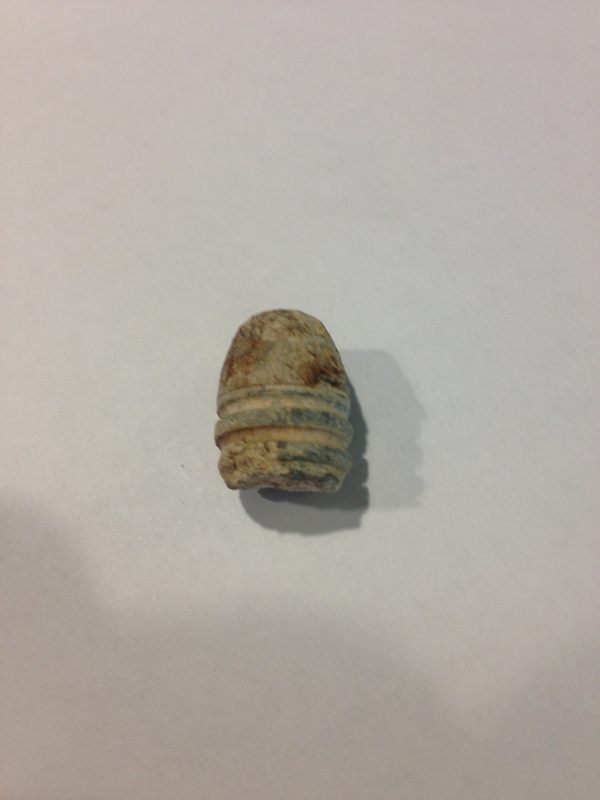 One target I dug turned out to be the hollow leg (in a stirrup) of what must once have been a lead toy. 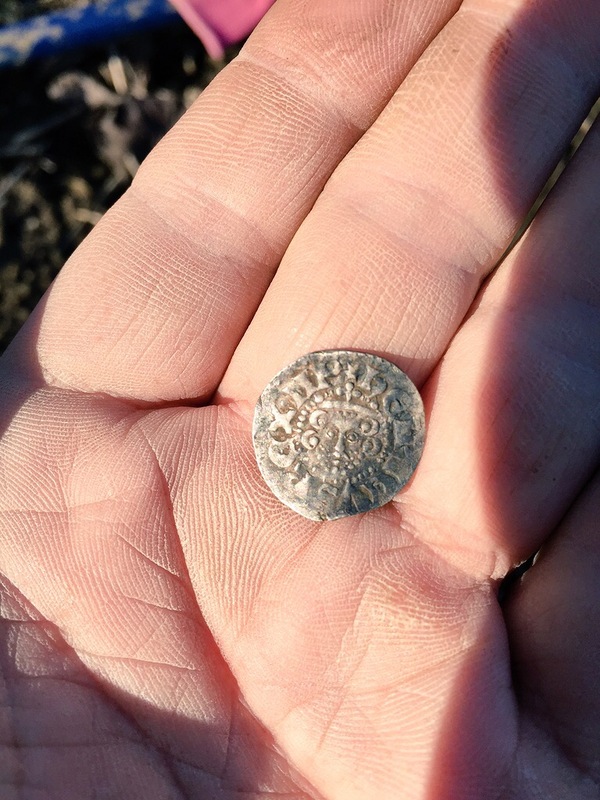 I started off on Ulmo with the intention of proceeding to Falstaff after finding my first coin. This proved more difficult than I’d anticipated. 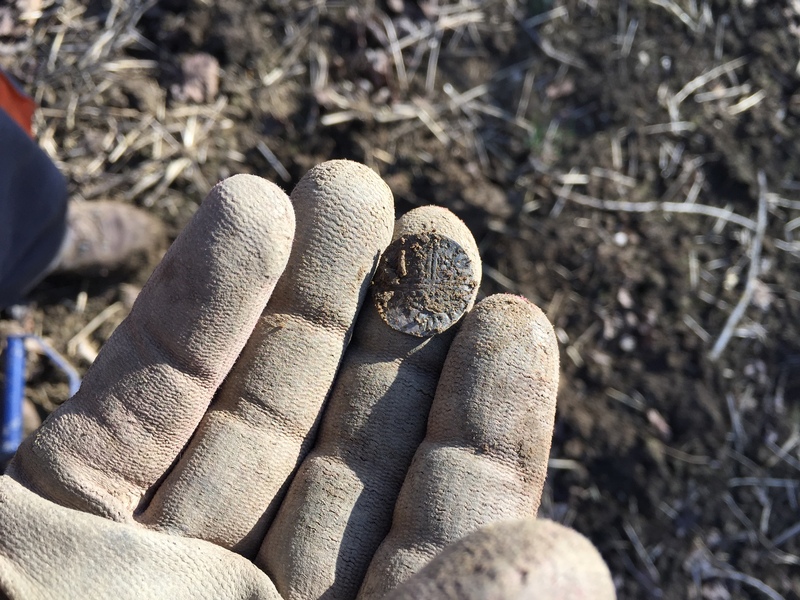 The field had dried out quite a bit thanks to the lack of rain over the last few days, but for the first time, Ulmo failed to give up Roman. 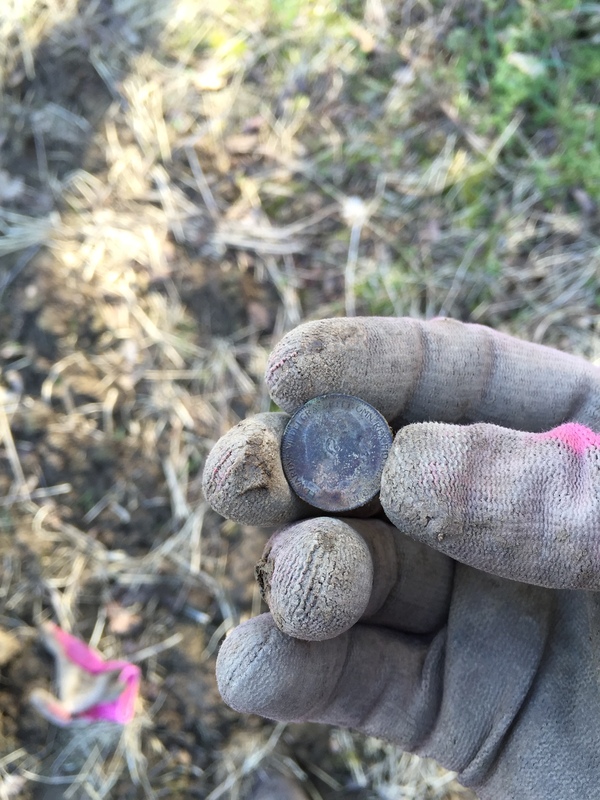 I was seventy minutes into the hunt before I found my first coin, an Edward VII farthing (1906). 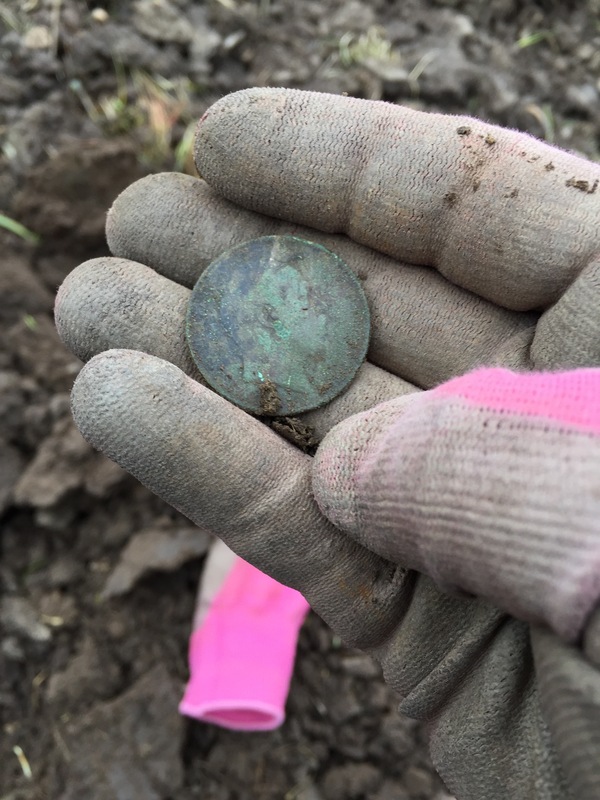 Some time later, still on Ulmo, I found my second Edwardian coin of the day, this one a penny (1904). 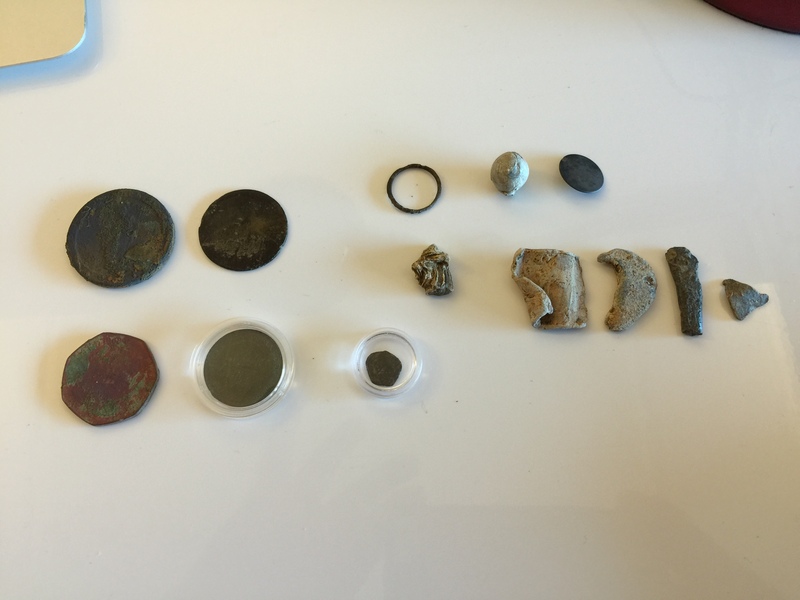 Unfortunately, the penny later slipped out of my finds pouch — probably while I was sat taking a rest — and was lost. 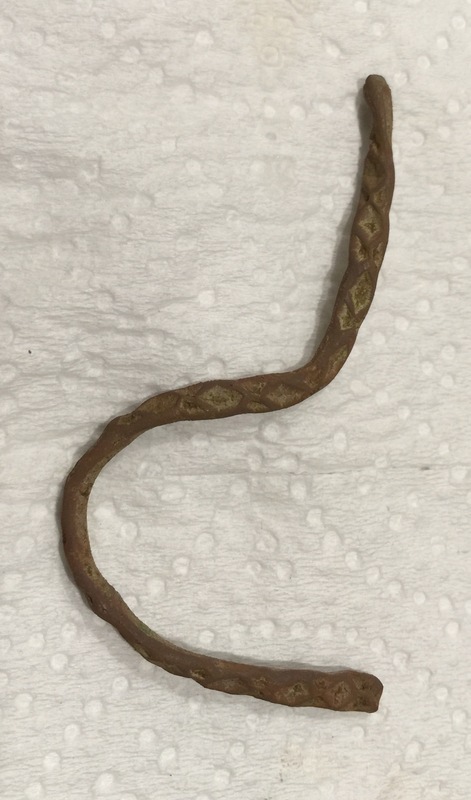 It was a bitter lesson, though I didn’t find out that it was missing until the end of the day’s hunt. After about two and a half hours on the field, I got a warbling tone whose number on the VDI nevertheless held steady at 60. 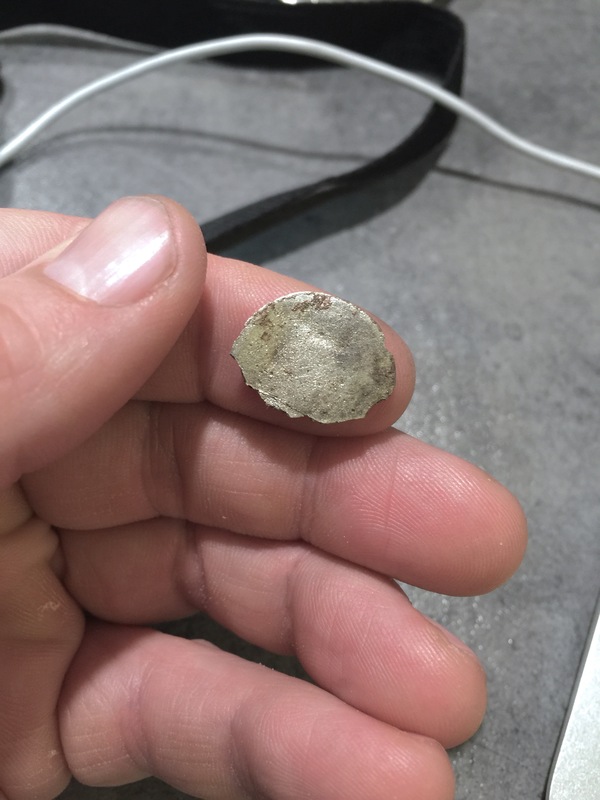 I dug the signal and about four inches down found my first-ever silver hammered, in beautiful condition. 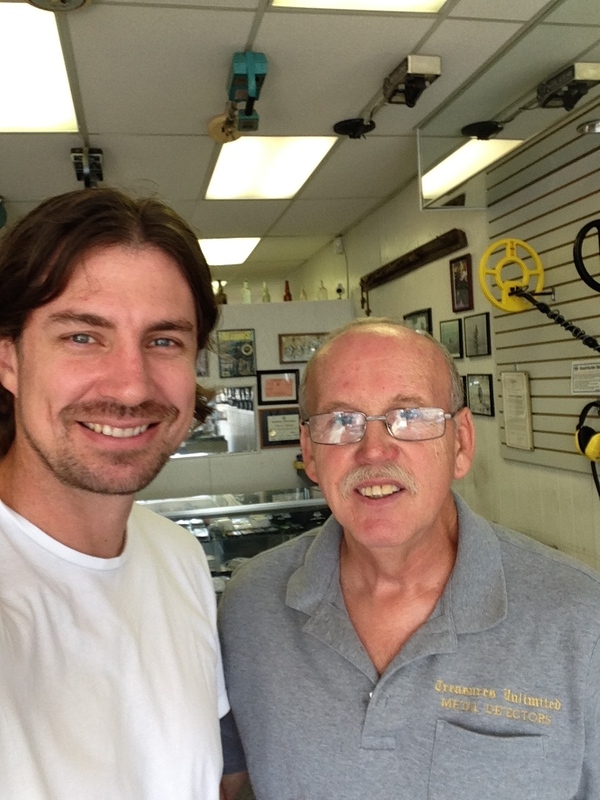 I cleaned it reverently, or as reverent as one can be with spit, and the bearded face of a medieval king shone at me. I tweeted out a request for ID assistance, and The Searcher magazine boosted my signal. 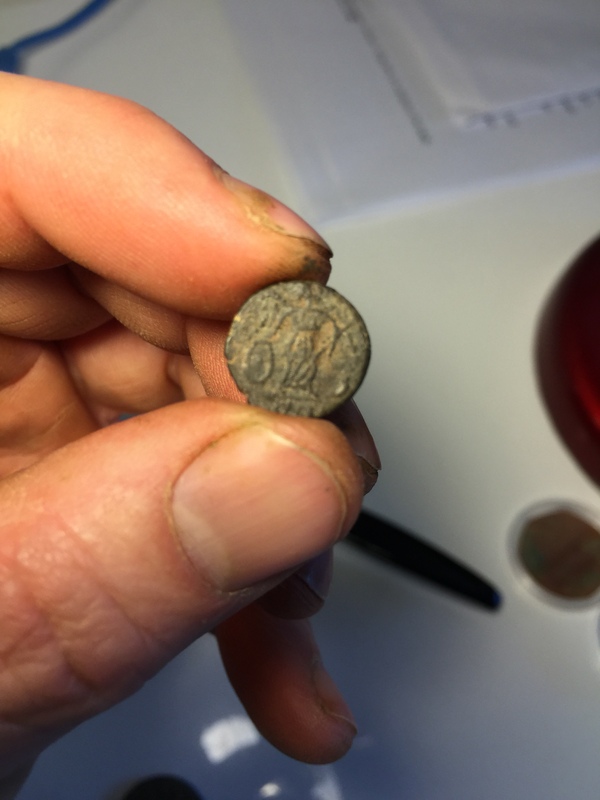 Within minutes someone had ID’ed the coin as a Henry III voided longcross penny (1240s). This will definitely be one to record with the FLO!